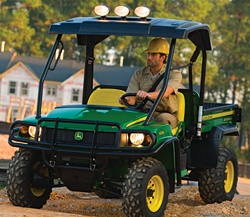 The Gator™ XUV 620i 4x4 features a 23-horsepower, liquid-cooled, twin cylinder, four-cycle gasoline engine. Advanced clutching with a tighter belt provides increased acceleration, a smoother ride at low speeds, and efficient engine braking to help going down hills. The vehicle has a 1,000-pound cargo-box capacity, a 1,300-pound towing capacity, and a 1,400-pound payload capacity. The optional Speed Limiter™ kit allows full power and acceleration with keyed lockout to limit top speed at 20 mph.